and by Taguchi et al. (DOI) in 2004, allowing the direct displacement reaction of an electrophilic alcohol by a nucleophilic carbon acid for example in the reaction of 2-octanone with butanol in presence of sodium hydroxide and a iridium catalyst. Both reactions require catalytic amount of base and metal. 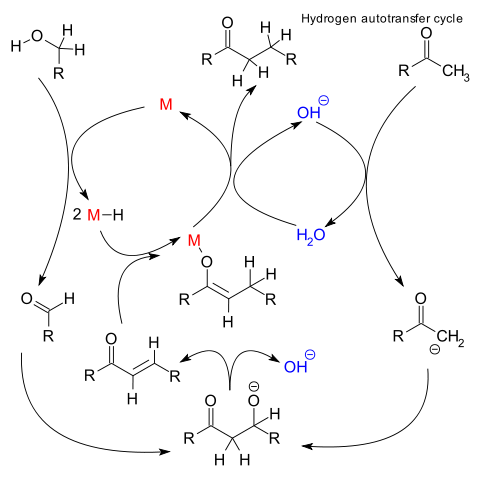 The alternative for this particular reaction would be tosylation (= activation) of the alcohol and use of stoichiometric base. Extension of: transfer hydrogenation (hydrogen donor is a reagent, not in-situ generated from substrate). The reaction is also a type of domino reaction.